Much to the chagrin of our regular readers who try to keep up with DQYDJ in a feed reader, we must once again anger you by asking you to click through to an article. It became tedious for us to calculate the ‘amount of the world economy’ of each country which was next in line to ‘possibly default’. Instead of quitting the subject entirely in disgust, we decided to just visualize the GDP of the entire world. 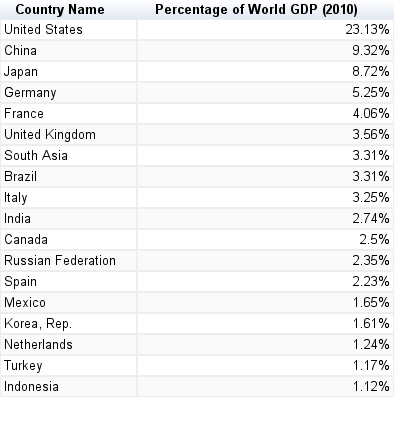 To that we have added the share each country contributes to World GDP. Because sharing is caring, our data is posted at IBM’s Many Eyes for you to edit and play with. Fascinating stuff, and a great visualization if we do say so ourselves. Beware a (insert country here) Default! All data is from the World Bank, and dates from 2010. Coming in at number one is the United States (with 23.13% of the world’s economy!). Our good friends Canada are number 11 in the world with 2.5%. These numbers are from 2010, so depending on current market conditions, either Italy or Brazil is in the number 8 spot with about 3.3% of World GDP. While I argued here that Greece doesn’t matter much, an Italian default would be a whole other ball game (it matters, in short). Which Countries are Too Big to Fail? So, how do we decide which countries would have a devastating impact? Well, as you recall from the Greece article, the Russian default of 1998 came a year after they were 1.34% of the world economy by GDP. That default caused worldwide liquidity issues and a massive bailout of Too Big To Fail Long Term Capital Management. Argentina’s default in 2002 (at a ‘mere’ .84% of World GDP in 2001) caused decidedly less issues. Let’s draw the line at 1% of the World economy. Without further ado, here’s your Too Big To Fail List! Readers, how much do you worry about an Italian default? A Greek? A French? A German? Really, what jumps out at me is how the U.S. is still such a substantial source of world GDP, and China is 2nd. Not a close 2nd, but it’s still ahead of everyone else. Anyway, as for default worries, I think that there could be serious effects felt in many places if there is a default by the counties you mentioned, particularly France. That being said, I only have so much bandwidth, so these events just get a passing thought from me as I read on the news. We are the 1%, haha. That’s the silly point I was trying to make in my GDP inequality article. I would be much more worried about a France default – I don’t know many countries that would be completely insulated from French fallout. I also do believe that they are in much better shape than the PIIGS, however, so my breath is currently not being held. I believe this year the US got bumped up to around 27%. Not sure if that says more about an improving US economy or a slowing global economy. Anyways, for me Greece is irrelevant. The bigger worry is Spain, Italy, and France. Though Italy today had a fairly good turnout for it’s bond auction (a good sign). A default by one of these three only pushes the others into default as well and will pull the US economy down with them. Think global recession ramifications. Not a good picture. I’m hopeful the Euro leaders will fix this in the next 6-9 months. Agree – Greece is mostly irrelevant. I’m worried about the domino effect, however. Just like the Defenestration of Prague, worldwide events can sometimes be traced back to small things (or maybe it’s a Butterfly Effect thing?). Admittedly, I must agree with the IMF’s assessment that any default in the G20 is unlikely. Default, generally speaking, is quite uncommon. The idea that two or more nations could default would be unprecidented, although not impossible. I think that the EU actually makes it more likely, what with the common currency and all… in an era of increased financial connectivity between world countries. That said, the odds were pretty low before… The last two I pointed out, Argentina and Russia, were both single country events, FWIW. I worry about every default. Like everyone has said before, Greece is irrelevant from an economic pov, but the emotional fallout and market bumps are something I should be prepared for….I’ve been planning my “what if” attack plan for some time. I kid! The same thing would have been true for Argentina or Russia – as LTCM can attest! Any default could set off a cascade of events, and it’s that domino effect that you need to watch out for.